A new version of EditTools has been released. It is available at wordsnSync and is a free upgrade to current registered users of EditTools. In addition to some minor bug fixes, version 5.1 includes a powerful, new macro, Code Inserter — an easy way to insert codes into a manuscript — and Assign Hotkeys — a new function that provides an easy way to assign hotkey combinations to EditTools macros. As you can see from the image, there is a lot going on in the Manager. The Manager has the usual Open and New options. 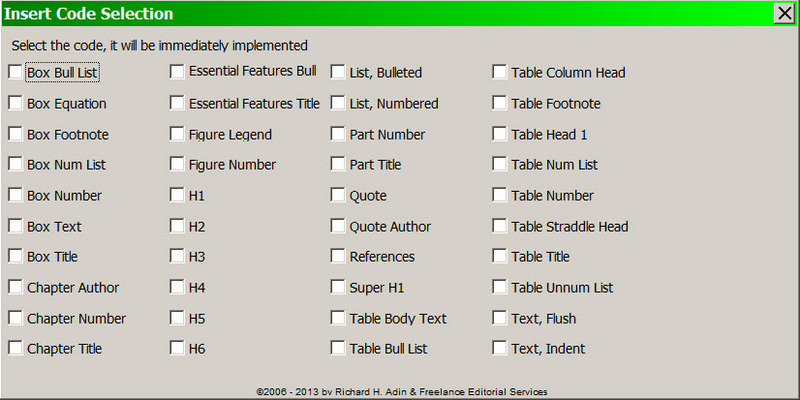 You can create a generic coding system for a client or one tailored to a specific project. You can also copy codes from one file to another using the Move/Copy Codes button. If it is a new file, the Manager will be empty. 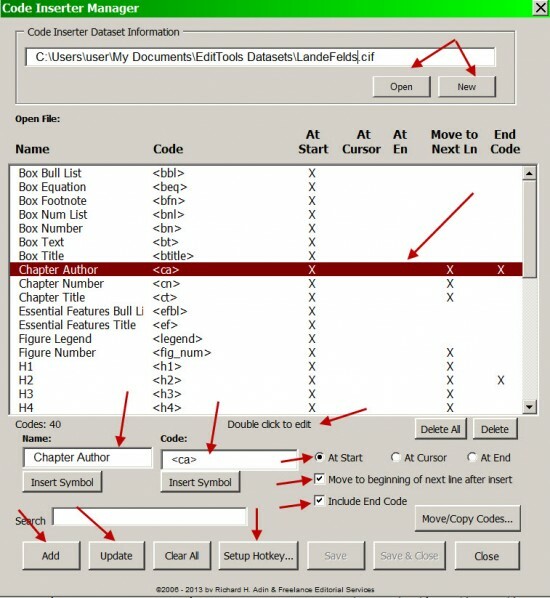 You enter a name for the code in the Name: field (Chapter Author in the example) and the code that is to appear in the manuscript in the Code: field (<ca> in the example). You then indicate where the code is to be inserted: At the start of the line (At Start), at the location of the cursor (At Cursor), or at the end of the line (At End). 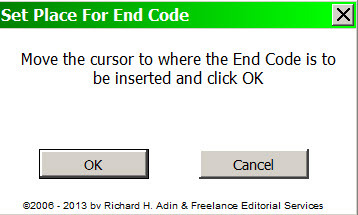 You also indicate whether, after inserting the code, your cursor should move to the next line automatically. Finally, you indicate whether an end code is needed. If you look in the main data field (where all of the codes in the dataset are listed), you will see that Chapter Author is highlighted. By looking across, you can see the name you gave the code, the code that will be entered, and which options you chose for that code (the Xs). When you run the Code Inserter macro, it brings up the box shown below, listing all of the codes you have created alphabetically by the name you assigned to the code. Just click on a code’s name or the checkbox next to the name, and the code will be automatically inserted according to the instructions you gave. Clicking OK will cause the end code to be inserted where you indicated and your cursor will return to where the beginning code was placed. As currently setup, to run Code Inserter you either need to click on Code Inserter in the main menu, then Run Code Inserter in the drop down menu, and finally on the code to be inserted. Alternatively, if you assigned a hotkey to the macro, you can press that key combination and then click on the code to be inserted. New in version 5.1 is an easy method for assigning certain macros to hotkeys. Not all of the macros are assignable; only those macros that are likely to be used more than once while editing a document. 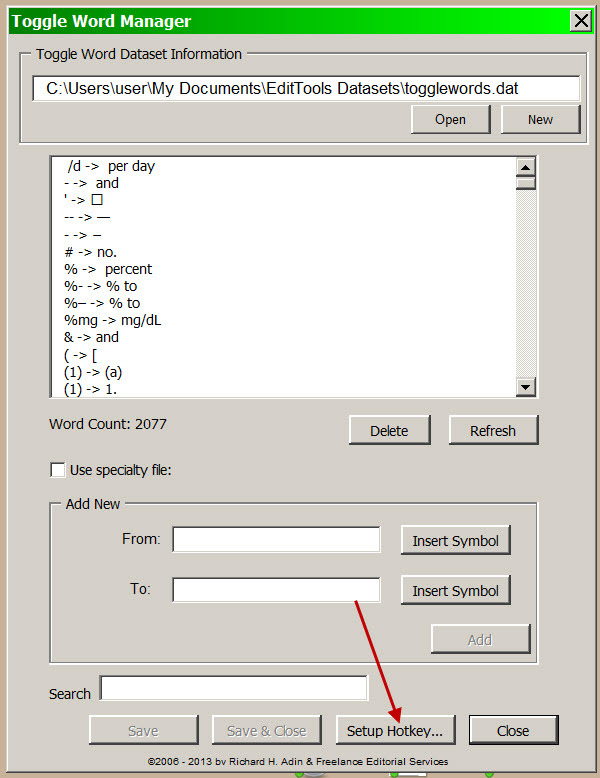 For example, it is expected that the Never Spell Word macro will be run just once on a document, whereas the Enhanced Search, Count, & Replace macro might be run multiple times. 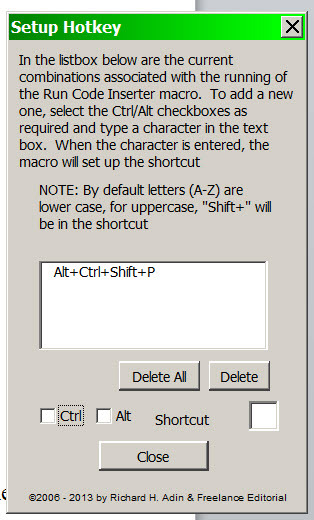 For those macros that can have hotkeys assigned to them but that do not have Managers, you access the Setup by going to Preferences > Hotkeys > Setup Hotkey for Macro, as shown in the image below. 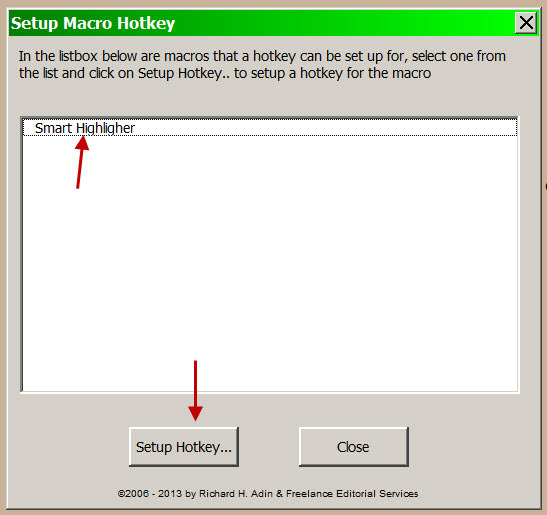 This opens a dialog from which you can choose which macro(s) you want to assign to a hotkey. The other macros for which hotkeys currently can be set are Enhanced Search, Count, & Replace and Smart Highlighter. Select the macro to which you want to assign a hotkey, and then click the Setup Hotkey button. When done click Close. These enhancements to EditTools have been under beta testing for a while and the reports are that Code Inserter has made coding quicker, easier, and typing-error free. Information about these and the other macros included in EditTools is available at wordsnSync. If you haven’t tried EditTools, you should. To download the latest version of EditTools, go to the Downloads page and click on “Download EditTools v5.1”. If you are interested in the ultimate deal, take a look at “A Special Deal: Editor’s Toolkit Ultimate!” This package includes the latest versions of EditTools, Editor’s Toolkit Plus, and PerfectIt at a significant discount.